A frozen heart is improving the quality of life for some cardiology patients following the start of a new procedure at the Norfolk and Norwich University Hospital (NNUH). Patients from Norfolk and Suffolk who have an irregular heart beat – atrial fibrillation (AF) – are benefiting from a treatment that freezes the veins leading into the heart. The cardiology team at NNUH have begun the procedure, called cryoablation, following funding for new equipment from the Norfolk Heart Trust. The Trust has capacity to carry out about 50 cryoablations a year. However, there is potential to increase the numbers of procedures with the planned development of the new Interventional Radiology Unit (IRU) at NNUH, which will increase cath lab capacity. AF is the most common type of abnormal heart rhythm, which is caused by uncoordinated electrical impulses that causes an irregular ‘quivering’ of the top chambers of the heart. More than one million people in the UK have the condition. When the heart does not contract at a normal rhythm, there is a risk of a blood clot developing inside the chambers of the heart. 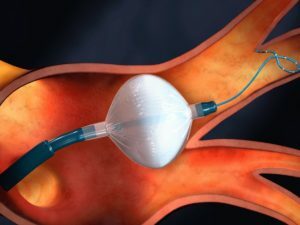 AF can be treated in a number of ways including electrical cardioversion, which involves using a defibrillator to give a controlled electric shock to return the heart to a normal rhythm, and medications to maintain a normal heart rhythm after cardioversion or in patients with intermittent forms of AF. Cryoablation is a new treatment method at NNUH introduced as part of an expansion in treatments for more complex disturbances of heart rhythm. The procedure, which involves a consultant cardiologist, cardiac physiologists, lab nurses and specialist nurses, involves inserting a balloon into the left atrium and freezing the four veins leading into the heart. 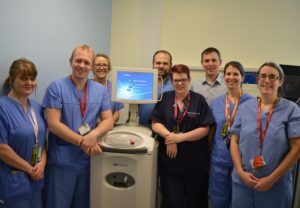 The cardiology department at NNUH received a donation of £14,400 from the Norfolk Heart Trust to purchase a Transesophageal Echo probe to assist with AF ablations. The charity is a very valued supporter of NNUH and raises funds towards new equipment or training that goes towards the fight against cardiac conditions.